For most situations a solar energy system is the best solution but there are times when a small wind system may the answer. Higher ground will mean more wind energy. Windspeed increases dramatically with elevation especially within the first several hundred feet of the ground. High ground can easily be 15 to 20 MPH more wind than a nearby low lying area. 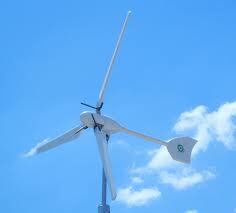 Trees and buildings can diminish wind energy more than you may think. A tower should be located several hunderd feet away from tall trees or buildings to diminish their negative affect. An example of an ideal location would a farm or ranch surrounded by fields or pastures and relatively flat land.